Taraji P Henson teared up as she discussed suicide rates among young black people. Gigi Hadid did the same as she spoke about the fate of the Rohingya people in refugee camps in Bangladesh. 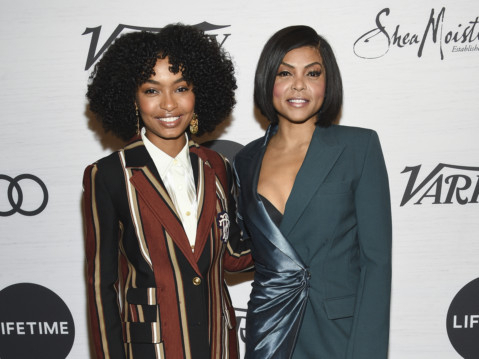 The two were among five celebrities honoured for their philanthropic work at Variety’s annual Power of Women event in New York. Bette Midler spoke passionately about her restoration work cleaning up neighbourhoods in New York City through the organisation she founded in 1995. Singer Kacey Musgraves talked about the importance of arts education for young people, particularly music. And journalist Christiane Amanpour evoked the grave dangers faced by reporters uncovering truths around the world, and especially decried the use of the term “fake news” as a weapon against journalists. “Increasingly we are in a war from within our own democratic societies where we are bludgeoned over the head day after day by this untruthful trope of fake news. It is very, very difficult to keep going,” she said. Honoured for her work with the Committee to Protect Journalists, Amanpour made a note of praising Jacinda Ardern, prime minister of New Zealand, for her leadership in the wake of the recent mass shooting in Christchurch in which 50 people died. Also appearing at the event were several accusers of R‘n’B star R. Kelly who had participated in the Lifetime documentary ‘Surviving R Kelly’. Lisa Van Allen, Asante McGee and Kitti Jones received a standing ovation from the crowd. Hadid, introduced by Jimmy Fallon, was honoured for her work with UNICEF. The 23-year-old supermodel spoke not only about her experience in Bangladesh visiting Rohingya refugees from Myanmar, but her use of social media as a force for good. “I feel resentment toward social media at times, but as I documented my trip with UNICEF, I understood the true value: someone is listening,” she said. Musgraves, cited for her work with the Grammy Museum, spoke of her admiration for fellow musicians like Loretta Lynn and Dolly Parton who’d paved the way for her. The foundation is named after Henson’s father, who, she explained, suffered mental illness after his return from fighting in Vietnam. She noted that she hadn’t always done work she was proud of, and that her career was actually “splattered with trash” — a nice segue to remarks about her work cleaning up green spaces in New York through her New York Restoration Project, which she founded in 1995.